What will future civilizations think of Manhattan Island when they dig it up and find a carefully laid out network of streets and avenues? Surely the grid would be presumed to have astronomical significance, just as we have found for the pre-historic circle of large vertical rocks known as Stonehenge, in the Salisbury Plain of England. For Stonehenge, the special day is the summer solstice, when the Sun rises in perfect alignment with several of the stones, signaling the chage of season. Had Manhattan's grid been perfectly aligned with the geographic north-south line, then our special day would be the Spring equinox, and if we so designated, the Autumn equinox -- the only two days on the calendar when the Sun rises due East and sets due West. But Manhattan is rotated 30 degrees east from geographic north, shifting the days of alignment elsewhere into the calendar. Upon studying American culture, and what is important to it, future anthropologists might credit the Manhattan alignments to cosmic signs of Memorial Day and, of course, the All-Star break. War and Baseball. Because Manhattan is so small (13 mile long) compared with Earth's distance to the Sun (about 93 million miles), the Sun's rays are essentially parallel by the time they reach Manhattan, allowing the Sun to be seen on all cross streets simultaneously, provided you have a clear view to the New Jersey horizon. Some major streets cross the entire island from river to river without obstruction, including 14th, 34th, and 42nd streets. While the May 28th sunset qualifies as the exact day for this auspicious moment, the surrounding days will also work, as the point of sunset migrates slowly north from day to day along the horizon, bringing with it ever-lengthening daylight hours. 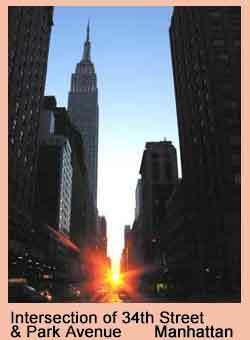 Sunset on Manhattan-henge begins at 8:10PM, at a cross-street near you. And, our newest OffbeatNewMexico.com for those enchanted by the Land of Enchantment. Thanks to FreeFind for providing the search technology for this website.